Michael Lomax [tumblr no longer available] is a young illustrator, graphic designer, and paper cut artist in Wales. 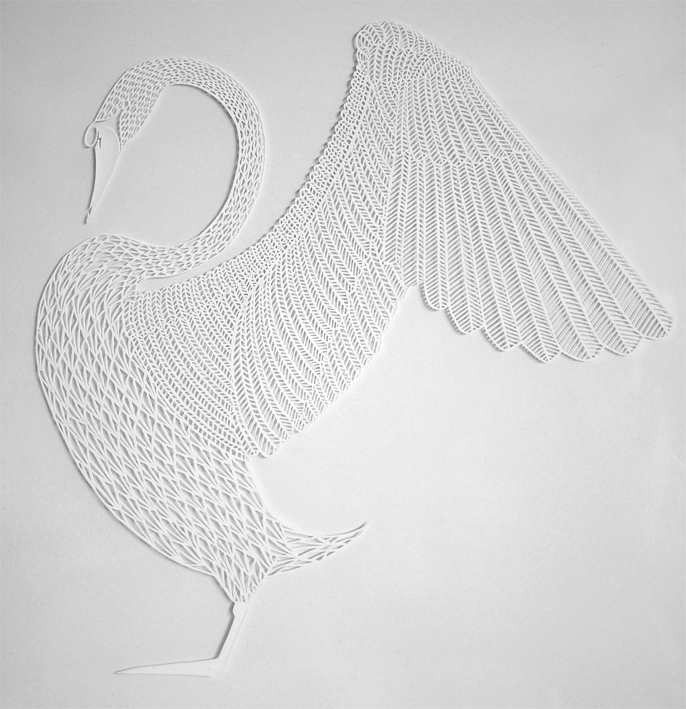 I came across a link to his website recently, and was delighted when it opened on this stunning white on white paper cut swan. The design captures both the grace and power of the bird, and the multitudes of fine cuts are just incredible. All those tiny herringbone wing cuts - oh my! I asked Mike what inspired him and he replied, "My paper cuts tend to go down the fairy tale route which is so rich in visual media that the inspiration is endless! I've got some exciting fairy tale-esque pieces planned for the near future too." Can only imagine what you'll do next, Mike - best success to you! Have a great weekend everyone, and I'll see you on Monday with a giveaway for something that I've been having a lot of fun with this week - can't wait to show you! That is gorgeous.. so intricate.. love it.. thanks Ann.. have a lovely weekend.. can hardly wait to see what you've been playing with.. Stunning, gorgeous. What a find! gorgeous, he has to have a lot of patience and sturdy hands!! I agree too...amazing work for sure. I am seeing a lot of paper cutting lately...makes me want to try it. Have you tried it Ann? I am wondering what type of paper to use if anyone knows. Stunning! What a talent! Really inspiring. Beautiful I must say.World is full of talented people. Inspirational to try something new for our new online shop. Looking forward to the giveaway. I love it and the intricate cuts make it so special. It almost reminds me of a crocheted image; just beautiful. I'm glad you all enjoyed seeing Michael's swan as much as I did. Cheryl, I have tried paper cutting... I need a sharper/better knife as I had trouble making smooth cuts. Am sure it takes a good amount of practice too. A medium weight paper is best from what I've read. Wow. I am so impressed by the patience it must take to do work this intricate. Such a pretty work of art. I love the delicate cutout paperwork of Michael's, thanks for sharing.